In one of the more outrageous examples of government overreach—and the field is crowded—the Goochland County, Virginia, school board decided to hold inquisitions for every fourteen-year-old homeschooler in their district. This story has me so incensed that I hardly know where to begin. Virginia law allows parents to teach their own children by either filing a letter of intent or stating a religious exemption. I am not very familiar with Virginia law, but it seems that the religious exemption option would lead to less government oversight, whereas the letter of intent requires some reports of progress. Therefore, for those families who are religious, taking the religious exemption makes sense. On January 9th, according to this article, among others, the Goochland school board ruled that when a child being homeschooled under the religious exemption reaches the age of fourteen, they have to make a statement of faith within 30 days of their birthday. If they do not comply, they burn at the stake. No! I made that up. Seriously, their parents can be criminally prosecuted. Furthermore, if the school board has any misgivings about the statement of faith, the child can be called to testify before the school board. In my opinion, it is cruel to force a fourteen-year-old to defend himself—and, by extension, his parents—in front of a bunch of adult strangers. There are so many problems here. The first is that this governmental body seems to be under the impression that it owns this child, including his soul, and is only allowing the parents to be caretakers for the state. While I might, grudgingly, concede that there are truancy laws in this country, and that parents should make some assurances to the local school board so that they won’t worry, let’s keep in mind that compulsory education in institutional schools is a relatively recent phenomenon. It was not until 1852 that Massachusetts became the first state to pass a law requiring the towns to build grammar schools and force parents to send their children for at least 12 weeks every year—and the parents were not happy about it! Today, if anyone sees a child accompanying her parents anywhere during “school hours,” they will ask her, “Why aren’t you in school?” As if our children are born incarcerated. Here is how responsible parents should interact with the local school board when they plan to teach their children at home. That’s it. Just informing, not asking for permission, because they’re your kids! The second, screamingly ridiculous problem is that the school board is setting itself up as a theological examining board. Is an M.Div. a requirement for Goochland School administrators? As I understand it, the point is to see whether the child agrees with her parents’ religious convictions, and if not, the school officials would probably consider themselves the great liberators of this child from her parents’ backward notions. If your fourteen-year-old has cemented his spiritual convictions already, he should go set up his own church. Most of us find this to be a lifelong journey. Furthermore, I’d give my last indulgence to watch the school board respond when the child stands before them and says, “My parents are paedocommunionists, but I have to confess that I am not sure that their position can be supported by Paul’s letters to the Corinthians.” If they could figure out what that meant, would it be grounds for terminating parental rights? Will they start in on straightening out all those quibbling denominations next? Many people misinterpret this “wall of separation” to mean that the church cannot interfere with the government, but it was obviously meant to affirm that the state cannot interfere with the church. Jefferson wrote this letter in response to one he received from the Danbury Baptists in which they worried that the state was going to collect taxes from them to support a state church, which would probably have been Anglican, but in any case would certainly not have been Baptist. 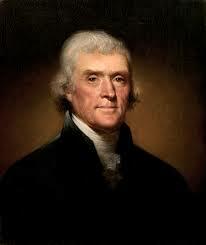 Jefferson reassured them that this would not happen, based partly on the First Amendment to the Constitution. It was announced Wednesday, after the case was taken on by the Home School Legal Defense Association and became national news, that the Goochland School Board suddenly realized that perhaps this was not such a good idea after all. We should all be alarmed, however, that this incredible bit of arrogance ever passed a vote by people who were at least respectable enough to have been elected to their positions. I fear that the people of our nation have become too willing to surrender their rights to those in power—or if not their own rights, the rights of their neighbors. Perhaps they think that it could never affect them, but the government is a ravenous creature, ever seeking more power and never satisfied. Freedom of conscience and freedom of thought are enormously important to our liberty. In the same way that I do not have to enjoy Charlie Hebdo’s cartoons to support their right to publish them, we do not have to agree with our neighbors’ religious beliefs or educational choices to support their right to live according to their own values. Not only does the government have no right to decide whether our religious beliefs are correct, they have no right to even ask what they are! And they certainly have no right to question our children’s opinions about this or anything else. 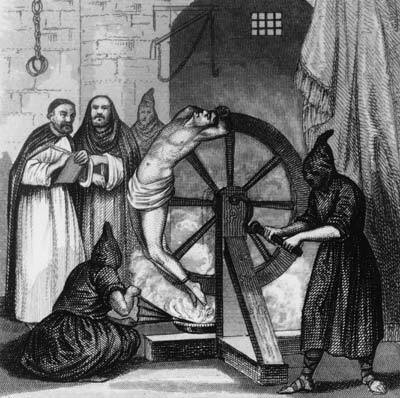 Spanish Inquisition drawing from Getty Images. 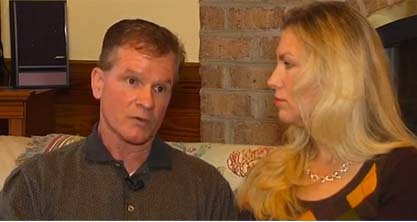 Photo of the Pruietts taken from the Independent Sentinel website at http://www.independentsentinel.com/virginia-school-board-demands-home-schooled-teens-justify-their-religious-beliefs/, accessed January 14, 2015.